Laser eye surgery is one of the three advancements to bad eye sight. It uses a laser to change the cornea to correct refractive errors such as nearsightedness, farsightedness, and astigmatism. 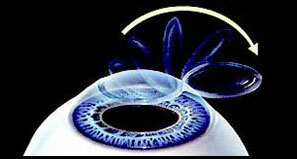 Laser eye surgery is permanent and improves your eyesight. It requires careful evaluation and consultation as it is not for everyone. It is a quick eye surgery that provides good vision with few postoperative complications for most people, but for others, the surgery may not turn out the way that is desired. Though glasses and contacts are very effective for fixing bad vision, they both have downsides. Glasses may fall off or break easily at most. For contact lenses, the cleaning processes each day and the chances for eye infections if not cleaned are big hassles about this invention for the eyes. With laser eye surgery, both of these are unneeded. However, a quick surgery with a laser directed into the eye, fixing the errors that are in the eye causing bad vision, may not be the best thing for everyone. Laser eye surgery makes it so that after the surgery, neither glasses nor contacts are needed to see with clear vision.